1. In a large pot of boiling, salted water, cook pasta according to package directions, then remove with a strainer, saving all the water in the pot, and set aside. 2. Return water to heat and return to boil. 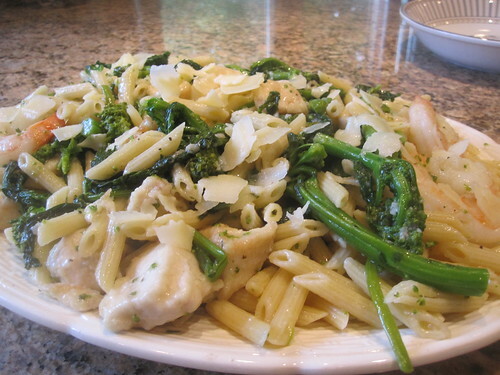 Blanch broccoli rabe for two minutes, then strain and set aside. 3. On a large plate, dredge chicken and shrimp in flour then shake off excess. 4. Heat oil over medium high heat in a large saute pan and cook chicken for 1-2 minutes on each side or until golden brown. Then add the shrimp, cook until pink about 2 min. 5. Add garlic, broccoli rabe, and salt and pepper, and toss to combine. Add wine, butter, and broth, stir to combine, and let simmer for 3-4 minutes. Add cooked pasta, stir to combine, and remove from heat. Serve topped with grated cheese. Mike found the broccoli rabe a bit to bitter, I loved it, you can always use regular broccoli. He also loved the shrimp better then the chicken, I loved both.